A Newton County woman told Channel 2 Action News that four hospitals turned her away before one agreed to remove a painful, massive non-cancerous tumor. Doris Lewis, 59, said she had been trying to get insurance since her husband died a few years ago. There was no sense of urgency, but then a huge tumor started growing inside her and she realized not having insurance presented a huge problem. The tumor has been inside Lewis for two months and has reached the size of a beach ball. “I didn’t know it was a tumor in there. I thought I was just gaining weight at first,” Lewis said. Lewis told Jones that doctors are amazed when they see her. “Some of the guys looked at me and said, ‘You got a tumor in there. That is so big. ‘Bout to pop,’” Lewis said. 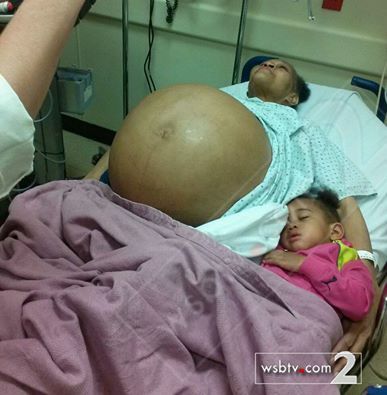 She said a doctor told her the tumor is benign and it is wrapped around her ovaries. Lewis said she has tried to get doctors to remove it, but no one would do the surgery because of some miscommunication and because she didn’t have insurance. “I’ve been trying to get insurance for the longest but had no success,” Lewis said. The tumor has her family very concerned. “I don’t know how long that she has to be able to live with this thing in her,” said daughter Sarina Lewis. Lewis said she was in so much pain, she called 911 one day and ended up at Emory University Hospital midtown. That’s where a doctor told her not to worry. “He said, ‘You will see a doctor without money,’” Lewis told Jones. Now she has a surgery date, a date she hopes will take a lot of weight off her shoulders. “It would feel great, now, if I could get it out today. Right now. It would be a blessing,” Lewis said. She told Jones doctors say they have never seen a tumor that size. The surgery date is set for June 10. Lewis is asking everyone to pray for her. Anyone that would like to make a monetary donation to help Lewis, can do so by going to any Wells Fargo branch with donations made payable to the Doris Lewis Fund.